The Jim Ellis Automotive Group is a chain of auto dealerships based in Atlanta with 15 locations in the area and a staff of over 1,000 employees. The company depends on a fast, reliable and secure network to connect with customers, employees and business partners and support key business applications across its dispersed locations. As Jim Ellis Automotive continued to expand they began experiencing network congestion. As the dealership added more locations and staff, the growing number of users put added pressure on the network and accessing the company’s cloud-based system became increasingly challenging. At the same time, the dealership was adopting additional cloud-based applications to which employees needed reliable access, further compounding the issue. Delays in system access negatively impacted customer experience, impeded employee productivity and led to frustration and complaints from workers across the network. 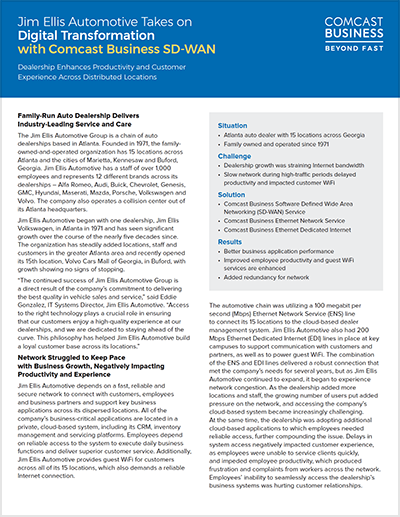 To address its connectivity issues, Jim Ellis Automotive participated in an early stage Software Defined Wide Area Networking (SD-WAN) trial with Comcast Business. As a result, the company’s video file transfer has been expedited and their employee productivity and guest WiFi service issues have been resolved. Workers noted an immediate improvement in network speed and their ability to access the shared cloud system, which in turn has helped boost their productivity and enabled them to deliver improved customer service. Since implementation, the dealership has not received one employee or customer complaint about connectivity. For more details, see the full case study here. Comcast Business has the largest IP network in the nation, serving the needs of small business through large enterprise customers. Technology solutions range from fast, reliable Ethernet and Internet connectivity to voice and video. Comcast Business is powered by an advanced Gig-ready network and 24/7 technical support. Comcast Business offers robust Ethernet services, providing a high-performance backbone that helps organizations securely manage growth and drive application performance. 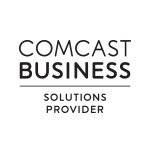 Comcast Business offers SD-WAN on its carrier-grade ActiveCore(SM) that enables a simplified software-driven IP Network that minimizes capital expense by reducing hardware and dependence on T1s and allows for centralized and consistent network management across locations.